New single On Your Corner is now live and streaming around the www. Listen through any of these links and check the East Coast tour dates below. New single On Your Corner is emerging into the big bad world on Feb 7th. 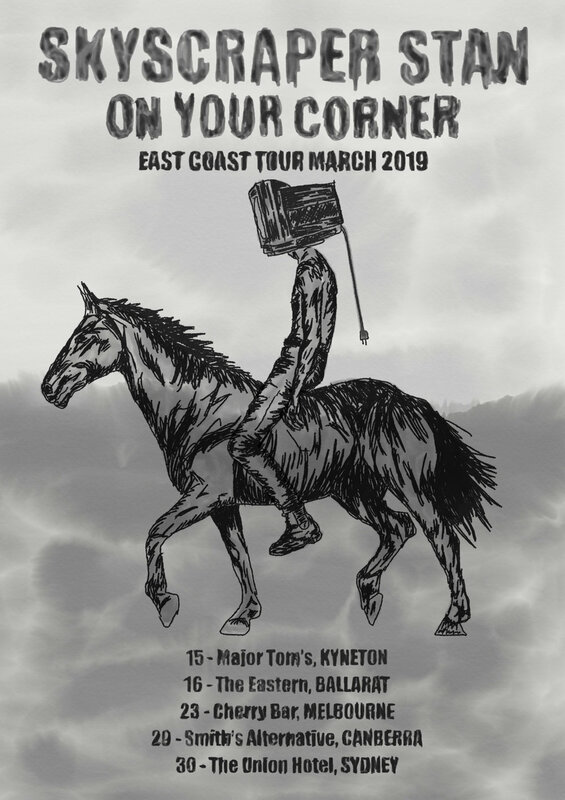 We’re heading off on an East Coast tour for celebrations and good times. Tickets are on sale now. Follow the links in the gig listing above. Isaebella Doherty has directed a hypnotic video for Tarcutta shade starring post modern dancer Alice Cummins and filmed on location in Kooroocheang, Victoria. Check it out. The opening track from Golden Boy, Tarcutta Shade has hit the airwaves. Listen to it below. Tour dates are listed above. The opening track from “Golden Boy”, Skyscraper Stan’s sophomore album with longtime band the Commission Flats, is emerging into the big wide world on the 24th of October. In anticipation of the release Stan and band have announced a string of shows around VIC, NSW, SA and TAS. I was about fifty clicks out of the Gold Coast when the hydraulic pressure drained from my clutch. Almost all the compression had already been lost from the van’s four overworked cylinders and now I was faced with a 1700 kilometre journey in a vehicle that stalled spontaneously, had no acceleration and refused to move through gears. It took two 17 hour days behind the wheel, multiple breakdowns and red-faced abuse from undersexed holiday makers but I limped into Castlemaine late last night, victorious. How did I do it? Well. I wasn’t so much driving as surfing a tsunami of good will. My spirit was unbreakable knowing that in 31 days we had raised nearly $11,000 for studio album number 2. I don’t know what to say to all of you aside from the obvious thank you, thank you, thank you. This process has given me so much more than the means to make another record; its given me the will. Touring solo can be emotionally desiccating. The third consecutive pub gig played to an empty room or a screaming table of miners leaves a singer’s spirit looking like roadkill in February. I set an ambitious target for the Pozible campaign because I want to make an ambitious album, I’m not sure if I ever believed we would get there. You have shown me support at a time I truly needed it. With every pledge came a word of encouragement telling me to keep moving, to shift gears even if the transmission was screaming. The studio is ready, the band is ready, I’m chomping at the bit. We’re going to make the best album we’ve made yet, we owe it to you. I’ll keep you posted as things progress, September is the projected date for getting everyone their CDs and records. For the generous souls who bought lessons, serenades and house concerts - we can make that happen any time you like, just get in touch. Cave" – Something You Said. Originally classing himself as a country musician his earlier influences included pre-war blues, the Laurel Canyon songwriters, Nick Cave and Sam Cooke. Since arriving in Australia in 2009 The Drones, Peep Tempel and Paul Kelly among others have been added to the list. His debut studio album, Last Year’s Tune, received 4 stars in the Syndey Morning Herald, the Sunday Herald (New Zealand) and No Depression (US) and five stars in New Zealand Musician Magazine. Since its release Stan has toured Australia, New Zealand and Vietnam, released a live album and written a song for academy award long-listed documentary 25 April. He has shared bills with artists such as James Reyne, Ian Moss, Marlon Williams, The Troggs, The Animals, The Church and C W Stoneking and has appeared at major festivals around Australia. released in March 2017. His sophomore album "Golden Boy (Vol I. & II.)" is currently under production.